Mary Vertastic, American Family Insurance, stops to pose for a quick photo at Campaign Celebration. Approximately 38,000 individuals and 1,100 corporations are projected to donate to reach United Way’s 2013 campaign goal. 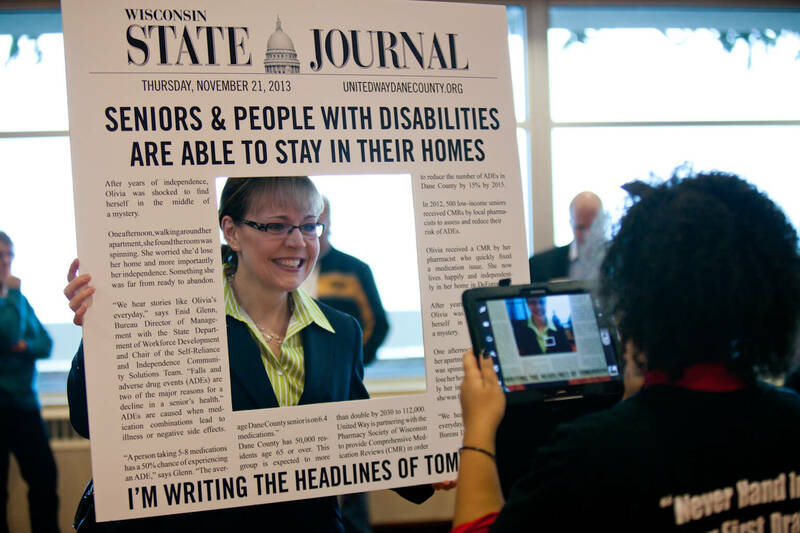 (Madison) Today, United Way of Dane County announced its projection to reach $18.1 million for its 2013 Campaign. Doug Nelson, 2013 United Way Campaign Chair and Regional President for BMO Harris Bank, kicked off this year’s campaign at Days of Caring at the end of August. He announced a challenging goal of $18.1 million, and the community responded with approximately 38,000 individual and 1,100 corporate donations. More than 900 local philanthropists including community and business leaders attended the celebration event at the Monona Terrace, generously sponsored by American Family Insurance. The event focused on illustrating the impact of improving academic achievement for all students in Dane County with the help from thirty youth from The Simpson Street Press, a local newspaper. These students interviewed attendees as they came to the event tweeting what headlines attendees would like to see in the future using #takeactionchangelives. Later in the program, these same youth reporters explained the importance of the investment and work in closing the racial achievement gap by sharing personal stories of how United Way’s initiatives helped them overcome obstacles in their own lives. Also announced at Celebration, was the winner of the Scion Sweepstakes. Teri Mueller from Dean Health Plan, won a 2013 Scion tC. Mueller was one of more than 12,000 people eligible who were automatically entered by making a first-time donation of at least $25 or increasing their donation over last year by at least $25. The Sweepstakes was made possible by American Family Insurance and TASC. Since 1998, tutoring initiatives have connected over 57,000 students in Madison, Sun Prairie, Middleton and Oregon with over 15,500 trained volunteers to help them read at grade level by the end of third grade and complete algebra by the beginning of 10th grade. In 2012, more than 2,261 families remained in permanent homes and avoided the instability of homelessness thanks to United Way’s housing strategies. A screening and intervention tool used to identify and address anger, anxiety and depression in youth reaches 2,500 of sixth-graders in the four major school districts in Dane County giving students a greater chance at reaching graduation through in-school behavioral intervention. Visit www.unitedwaydanecounty.org and click on “Volunteer Now” or call United Way 2-1-1 by dialing 2-1-1 or 246-4357. Recognizes organizations for having the largest total giving to the campaign. Recognizes organizations that have the largest percent increase in the number of new donors. Recognizes organizations that generate the largest percentage increase in employee giving. Recognizes organizations with the highest percentage of participation in their employee campaign. Recognizes companies that have the largest average gift per employee. Recognizes organizations that have the largest dollar increases in their employee campaigns. The Innovation Award celebrates an organization’s commitment to raising awareness and resources during the campaign, increasing participation, and retention an innovative way that helps us advance the community’s Agenda for Change. In addition to being creative, these organizations make leadership giving a priority, and implement best practices for growing a successful workplace campaign.